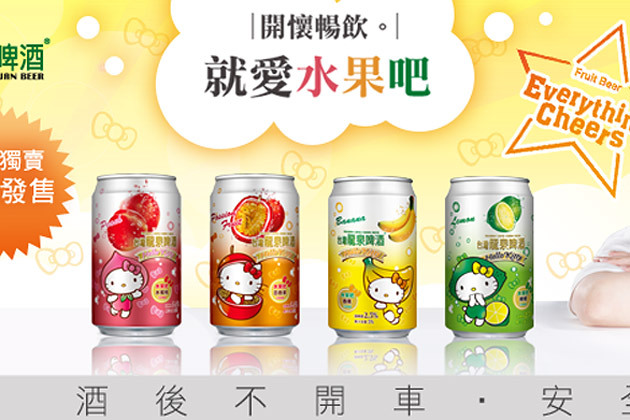 Consumers in China and Taiwan can now pick from six fruit-flavored brews, including peach, lemon-lime, passion fruit, and banana, sporting the cartoon cat on the can. With about half the alcohol content of a Budweiser, they're not very potent. But as Kotaku's Eric Jou put it, "They're so ridiculously smooth and tasty that one can barely tell they're drinking beer. It's almost like drinking fruit juice, even if the cans do say 'beer.'" This is for the kids, right? Maybe not. Hello Kitty has plenty of adult fans, especially across Asia (we are, after all, talking about a 40-year-old icon). This seems more like a silly but smart branding ploy to reach China's great untapped booze market: women. Reliable figures on drinking habits in China are apparently tough to come by. But as a World Health Organization bulletin recently argued, the statistics we have suggest that, "high-risk drinking behaviour has reached epidemic proportions" in the country. That is, epidemic proportions among men. Only 15 percent of women considered themselves drinkers, compared to 55.6 percent of males, according to another national survey. For every 1 female alcoholic, there are approximately 33 male alcoholics. In other words, it's reasonable to suspect that beer might have an image problem with some Chinese women. If so, how could a beer company cater to them? A low-alcohol, sweet beverage seems like a good place to start. And why not market it with a familiar cartoon character that's become a symbol of childlike innocence the world over (which is pretty much the exact opposite of a bunch of men getting sauced)? Sounds pretty canny to me. *This may or may not be the first time Hello Kitty has been used to sell beer. In 2009, the image of a Hello Kitty-branded six-pack of Beck's began floating around the Internet. However, the photo looks pretty dubious, and many versions include a logo from the image editing site Blingee. I haven't found any official confirmation that the picture is real (Anheuser-Busch Inbev has yet to respond to my email). UPDATE, 1:50 PM: An AB Inbev spokeswoman has confirmed that the image was in fact a fake.